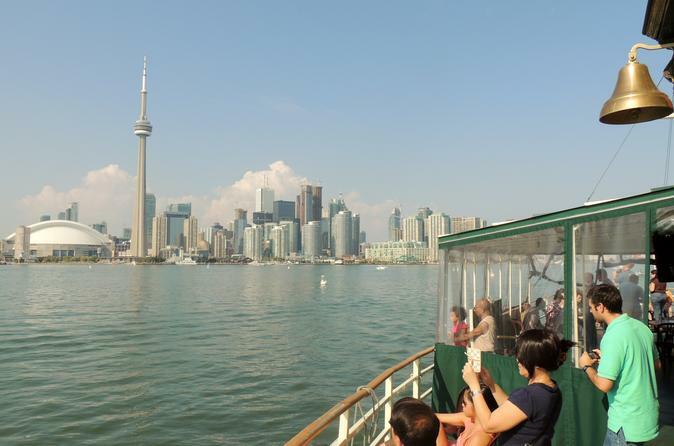 Admire Toronto’s sights from the water on this Toronto Harbour sightseeing cruise! Enjoy live narration as you pass places like CN Tower, Harbourfront Centre, Sugar Beach, HTO Park and the fabled Gibraltar Point Lighthouse. Choose from multiple departure times throughout the day. Board your spacious, comfortable cruise ship at Toronto Harbour, located on the north shore of Lake Ontario and surrounded by the Toronto Islands. This natural harbor and commercial port has many waterfront uses, including recreational activities. With multiple departure times throughout the day, you have the flexibility to sightsee when you want. On your 45-minute Toronto Harbour cruise, admire sights from a unique vantage point and enjoy live onboard commentary about the landmarks you pass. From the indoor cabin or outer decks, you’ll catch views of Queens Bay Terminal, the Toronto Island Airport, Harbourfront Centre, CN Tower, Rogers Centre, HTO Park, Sugar Beach, Redpath Sugar Refinery, Air Canada Centre and the fabled Gibraltar Point Lighthouse -- as the oldest landmark in Toronto, this lighthouse bears witness to nearly 200 years of Toronto's history, including many famous legends and unsolved mysteries.